Add some class to any occasion with these Silver Plated Roundel Cufflinks. These Silver Plated Cufflinks show the iconic Royal Air Force Roundel. 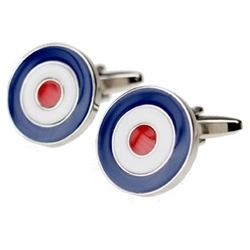 Each silver plated cufflinks show the red white and blue RAF Roundel. With a silver plated base and enamel filled rings, these cufflinks are presented in a gift box. These RAF Roundel cufflinks are a great gift for any Royal Air Force enthusiast.